Witty, wonderful, and wise, Vivian Lorraine (Maze) Rude lived a life rich in family, activism, and adventure. A devoted wife, fun mother, loyal friend, and loving daughter, Vivian’s love, patience, and kindness proved a powerful inspiration for all who were blessed to know her. Politically passionate, Vivian’s devotion to democracy was undauntable and her efforts to make a difference numerous. Viv’s love of life, compassion, and advocacy continue to resonate through her short stories and poetry, as well as the in the hearts of those she loved. A beacon of unconditional love to all, Viv's family and many friends in her communities of Muskegon, East Lansing, and Taos will long miss her sparkling blue eyes and quick wit. With The Great War behind us, 1920 gave birth to many firsts that helped pave the way for a decade of abundance and much celebration for our nation. The year began with high hopes as The Great Steel Strike ended and the US census proved, for the first time in history, more Americans lived in urban areas than rural. With the inventions of the hair dryer, Qtips, and traffic lights a greater ease and comfort for many became the new normal. Hope grew exponentially later in the year with the ratification of the 19th amendment which granted women the right to vote and millions of women were working white collar jobs. While riding the post-war quiet and the nation’s feelings of high hope and good fortune, Gail and Lillian (Lange) Maze welcomed their daughter Vivian into their hearts and home on April 9. Growing up as an only child on 1938 Jiroch St. in Muskegon MI, Viv was the center of her parents’ world. Her father was an engineer and her mother a homemaker; both doted on Viv with deep love, unwavering support, and overprotection. Though she did not have any siblings, she shared a close bond with her cousins and special friendships with Sophia Ouwerkerk, Rob Lemieux, Janet Rypstra, Julius Capua. 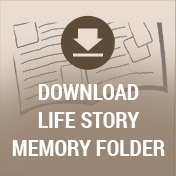 Her childhood adventures included many days spent with her small dog Scamper, fishing with her parents, and helping her parents build a log cabin on Big Star Lake where they spent every weekend. The family also took many trips to visit relatives in Chicago. Viv found the city exciting and returned to enjoy the arts throughout her life. A strong student from the start, Viv attended elementary school at Moon School in Muskegon. Viv studied piano, played as an accompanist, and in time became quite accomplished in her art. 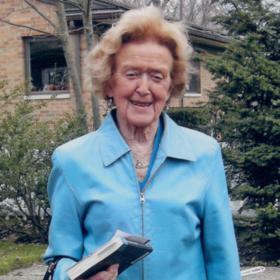 After graduating from Muskegon High School with the Class of 1938, Viv continued her education at Muskegon Community College, then the University of Michigan, where she lived in Martha Cooke women’s residence, and worked on the Education Digest in Ann Arbor. Viv proudly graduated from U of M with her BA in Journalism in 1942. In addition to her degree, U of M also gifted her with the love of her life--Art Rude. Viv and Art first met the week they were graduating when Viv was checking him out for one of her girlfriends. With Viv’s ok, her friend and Art went out on a date. Upon returning from the date, she shared with Viv that Art was a much better match for her. Soon Viv and Art were dating and planning a future together. On January 31, 1944, the happy couple married and began their beautiful 70 - year adventure. In 1945, while Art was overseas, Viv gave birth to their first child, son David. 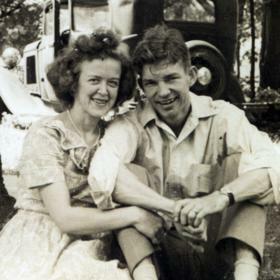 During Art’s years in law school, they welcomed daughter Virginia (Ginger) in 1948, and in 1955 their family became complete upon the birth of daughter Barbara. After completing law school in Ann Arbor, Viv and Art chose to settle their family in Muskegon where Viv relished in home management. Viv consciously built her home on a firm foundation of unconditional love. She embodied the principles of forgiveness, support, generosity, caring, play, appreciating one’s gifts, and answering the call to service.  In so doing, Viv showed her children through her example how to live a meaningful life. Nothing was more valuable to Viv than time spent together, celebrating the gift and strengthening the bond of family. Viv was involved, thoughtful, kind and fun; smart, outspoken, full of laughter and hugs; she baked awesome cookies and pies and was wise enough to listen first, especially when the children were in trouble. Her children fondly remember Viv playing the piano with passion in the living room; sitting by the fire on a hike in the high Sierras; sharing a chat and a glass of wine at the cabin; making cocoa in a thermos for skiing, and rubbing away their pain with her loving hands. Regardless of their age, each of her children cherished coming home to her from living far away, and always finding her beautifully dressed, with her hair done, and the smell her famous oatmeal cookies in the oven. In every action, she showed she cared about them coming home and wanted everything perfect. As her family grew to include grandchildren, so did Viv’s joy. Without a doubt, Viv’s grandchildren were her heart’s delight. 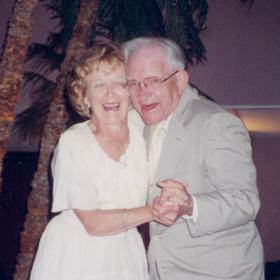 She loved sharing suppers and bonfires at the cabin on Lake Michigan; attending their theater, sports, and music events; playing and reading together; and listening to their life dilemmas from childhood through breakups, partnerships, and marriages. Welcoming their children, her great-grandchildren, into the world was especially wonderful. With Art, Vivian found over 70 years of both love and adventure, which she managed the home. Viv was known as “Little Miss Maze,” she tap-danced at the Grange Hall on Apple Avenue and turned that talent into show-stopping ballroom dancing with Art. People eagerly cleared the floor to watch Viv and Art dance, enjoying the thrill of witnessing a special couple with a special connection that beamed forth on the dance floor. Friday night suppers were shared with the family on the patio in summer and Sunday night suppers were enjoyed with Dolly and Bill Rude. They sailed on Lake Michigan, went snow skiing in Northern Michigan, the Rockies and the Alps; water skied, bicycled and played tennis together. Together they loved visiting Norway, England, Paris, chasing whales off the Baja peninsula, hiking, and spending time with family in Canada. They built a solar home in New Mexico, spending many vacations there, and the cabin on Lake Michigan held four generations of family and friends who gathered with them every summer. Viv naturally possessed an insatiable passion for life and learning; she was a brave and optimistic adventurer who embraced each moment with wonder and gratitude. 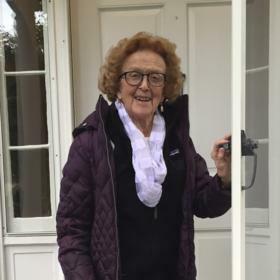 A woman of infinite interests, Viv enjoyed gardening, reading, tennis, skiing, playing piano, attending concerts, camping, sailing, and travel. A staunch feminist, Viv’s passion for women’s rights, civil rights, and education was unrivaled. Not only did Viv speak her truths, she lived them. Vivian was a lifelong member of First Congregational Church UCC of Muskegon. She was a lifelong patron and supporter of Hackley Public Library, serving many years on the Board of Directors. She volunteered as a docent at the Muskegon Museum of Art, sharing her love of permanent and contemporary exhibits with adult visitors and school children alike. She ran for office, worked with the League of Women Voters and the AAUW for the advancement of women and people of color. For many, many years Viv actively gave of her talents and volunteered her time with the American Association of University Women, Ulysses Books Group, Great Books, Girl Scouts, served as a board member at Muskegon Community College, all in the effort to actively be the change she wished for the world. 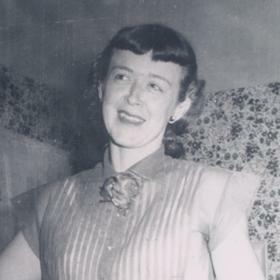 And as her favorite bumper sticker says, “Ginger Rogers did everything Fred Astaire did, only backward and in high heels!” Viv pursued her interest in journalism, exercising her love of literature and politics throughout her life, as a writer of short stories and poetry. She published a limited-edition collection of her stories and poems. A lifelong learner, Viv pursued her personal growth every day of her life including learning to snowshoe at 95! Vivian made friends easily and had too many to name. As older friends aged and passed away, Vivian continued to make new, younger friends who loved spending time and sharing ideas with her; she used to say they kept her young. One younger friend recently described her as “…that incredibly beautiful, smart, funny, witty, strong woman I was so proud to call ‘My Vivian.’” Not only did her own kids share their lives candidly with her, but many of their friends treasured her as a confidante and thought of her as their “other mother.” Viv had various cats through the years, but her dog Nika, a Siberian Husky, was her beloved companion for 13 years. At the end of her life, Otis, a Belgian Shepherd, kept her company and listened to her read poetry to him on the couch. With a natural gift for finding beauty, commonality, and purpose in everything and everyone, Viv was a builder of bridges between people. She loved beauty and always sought the details in the day that reflected beauty in nature, a breath of fresh spring air, the piercing song of a cardinal, the blossoms in her garden holding a drop of morning dew. She said her “gratitudes” every night, acknowledging her good fortune and what was going well, in spite of whatever troubles the day had held. Her ability to find the gold in every moment is most evident in her final moments. Upon diagnosis of her terminal illness, she confided to a friend that, among other things, she was grateful that “…everyone in my family is a Democrat!” While never intrusive or judgmental, she always listened, shared her wisdom thoughtfully and respectfully, and was a trustworthy confidant for all who knew her. She always wanted to know where the moon was at night. She would step into the street to check its phase and position, cloud-covered or bright, waxing or waning; a constant in the sky through the changing phases of life, it was like a companion in the universe. While it is hard to imagine life in the absence of Viv’s bright and beautiful presence, may it afford deep comfort to know that we carry the light of her legacy in our hearts and lives. With each moment we truly listen, oatmeal cookie we bake, turn on the dance floor we take in the arms of our beloved, and democratic vote we cast, we celebrate the many gifts Viv so generously shared with us. And in so doing, we ensure that her spirit continues to emanate out to a world that continues to need her wisdom and love. Vivian Lorraine (Maze) Rude of North Muskegon, Michigan, age 97, died of a sudden illness on Saturday, December 30, 2017, while visiting family in Taos, New Mexico. She was born in Muskegon, Michigan on April 9, 1920, to Gail and Lillian (Lange) Maze. Vivian is preceded in death by Art, her beloved husband of 70 years, and is survived by her three children, whose lives expanded the adventures to California, New Mexico, and Canada. She leaves 7 grandchildren and 4 great-grandchildren. Family members include son, David Rude of Los Gatos CA; daughters, Ginger (Kate O’Neill) Rude Mongiello of Taos NM & Barbara (Andrew) Rude Roberts of Canada and currently East Lansing MI; grandchildren, Syri Mongiello, Risa (Chad) Haddal, Adam (Sheena) Rude, Eric (Tracy) Rude, Monica (Jack McLean) Rude, Hugh (Joannie Dube) Roberts and Neil Roberts; great-grandchildren, Haakon and Christian Haddal, Oliver and Lydia Rude. Beloved family also includes Robert Mongiello and Tina Rude. As an only child, Vivian found sisters and brothers in Art’s family; she leaves Dolly and Bill Rude (Art’s brother) along with their family: Dawn (Jim) Rude Stuberg; Bruce (Cheryl Tanouye) Rude & Kavi, Lynne Rude Twining & Paige. Nieces, Donna Rude, Mary Michelson and Linda Schoof, will also miss her. A memorial service for Vivian will be held after winter travel hazards abate and when forsythias bloom, on Saturday, April 21, 2018, at 3:00 pm at First Congregational Church UCC, 1201 Jefferson St. Muskegon MI. MEMORIAL: In lieu of flowers, contributions can be made to the Southern Poverty Law Center, Planned Parenthood, the Muskegon Museum of Art or Hackley Public Library.